Not in My Name is managed by Theatre Veritae, a North-West-based company producing relevant contemporary theatre with integrity, founded and led by Alice Bartlett and Andrew Raffle. Theatre Veritae is especially committed to work that engages audiences in meaningful conversations beyond traditional theatre spaces, thereby establishing unique theatrical dialogues specific to a local community or region. This ethos has been central to the continuing development of Not in My Name and, as demand for the play spreads well beyond its Lancashire home, new local partnerships with trusted artistic and municipal organisations (including councils, police forces, schools, colleges, universities and theatres) ensure appropriate adaptation of the project to meet the needs of each new area, alongside assurance of longer-term support structures for tackling the complexities of the Prevent agenda. 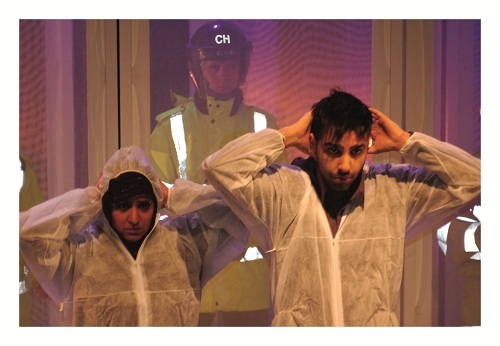 To date, Theatre Veritae have produced area-specific productions of Not in My Name in Lancashire, Merseyside, Cheshire, County Durham and Greater Manchester, with comprehensive partnerships in place in all of these areas.